Published by Harcourt Brace, April 1999.
Who coils around her eggs in a stack? Who nestles her baby on her back? Who cuddles his chick on his feet? Who hides her baby in a pouch so deep? 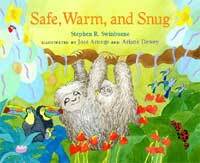 Snuggle up with this delightful collection of verse and discover the special ways that each animal species protects its babies from predators and the elements, keeping them Safe, Warm, and Snug.